NORTH CENTER — Three people were taken into custody Tuesday afternoon during an anti-fascist protest outside of a Cook County branch courthouse. About 50 activists gathered at the courthouse at Belmont and Western avenues around 2 p.m. to protest a hearing against a man they said is a white supremacist. The protest took place for about an hour before demonstrators began to walk east on Belmont. While the crowd began walking on the street, the march was halted when police took into custody one of the people at the head of the group. Around a dozen officers were on the scene at 2452 W. Belmont Ave. and quickly took a second person into custody when activists tried to intervene in the arrests. According to multiple eyewitnesses, police asked demonstrators to move onto a nearby sidewalk. As the group moved toward the sidewalk, witnesses said, an exchange between a police officer and a demonstrator set off a series of scuffles that ultimately led to three arrests. It was not immediately clear Tuesday what caused the first fight. Officer Thomas Sweeney, a Chicago Police spokesman, confirmed three people were arrested and said charges were pending. The third person was arrested in the parking lot adjacent to the courthouse and police station. A woman who was involved in the protests but asked not to be identified said she watched as a black Ford Explorer slowly drove toward a protester. "He kept inching forward into them as they were backing up and almost pinned them between that car and a police car that was parked there," she said. When one of them took a photo of the driver, the woman said the driver "slammed him to the ground" before multiple officers moved in and arrested the activist. As multiple marked squad cars rushed to the scene Tuesday afternoon, one demonstrator could be heard shouting to police, "F--- you, you fascist f---s.' A passerby slowed down his car and shouted toward officers, "Put 'em in jail!" After the arrests, protest organizers arranged a second rally outside the police station at 9 p.m. to provide support to the detained individuals and call for their release. The earlier protest was meant to "expose and denounce the rise of the far right nationally and locally," protesters said in a written statement. Protesters likened the police action to tactics used by white supremacists and accused officers of displaying brute force in an attempt to intimidate the activists. "As organizers, we know, now as ever, that the police are part of the same fascist structures which have produced the state of social violence we see today," wrote the organizing groups Black Rose-Rosa Negra Chicago and Haymaker Chicago. 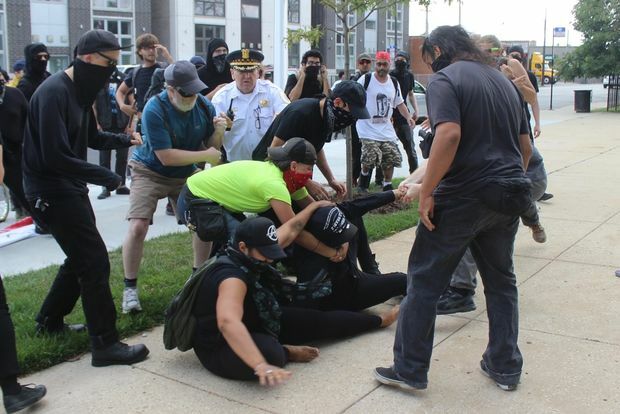 Police, prosecutors and court records could not verify the claim that the man being protested at the rally is a white supremacist, but one person at the protest said he was attacked by the same man in late July. The 39-year-old victim said he was driving his pedicab during Wicker Park fest when the man took his photo and flipped him off, drawing his finger across his throat in a slitting motion and commenting on the victim's T-shirt, which bore the logo of anarchist, anti-fascist website It's Going Down. When he saw the man in the park a while later between Big Star and the north end of Wicker Park, he decided to get a photo of his own, which was when he said the man attacked him, pulling out a knife at one point before bystanders intervened. The victim, who said he came to the United States from India as a 6-year-old, needed seven stitches on his face due to his injuries. He filed a police report, but said officers were dismissive of his claims that the attack was racially motivated. The activist said he didn't know who the man was at the time, but a friend showed him posts about his alleged assailant on anti-fascism websites, and the victim said he recognized the photos instantly. Since the July 29 attack, he said he hasn't been able to bring himself to drive his pedicab, feeling unsafe. To help cover the expenses he incurred and make up for his lost pedicab profits, supporters donated more than $3,000 to him within two weeks through Indiegogo's Generosity offshoot. He also hadn't worn the It's Going Down shirt again — until Tuesday. "I've been in this country for three decades, and I've dealt with violence from racists for a long time," he said. He recalled learning about the Hindu-focused hate group DotBusters while living in New Jersey as a child and seeing firsthand what it meant to be a person of color in the United States. "It's always been there, it just kind of ebbs and flows," he said. "Now we're in a period where people feel so emboldened to be openly racist and violent, and there's a lot of reasons for that." Some protesters Tuesday, like 21-year-old RJ and Sister Michael Oboza, recognized one another from the Downtown rally Sunday, where hundreds of people gathered to condemn racism and bigotry in the wake of a violent white supremacist gathering in Charlottesville, Va. over the weekend that left one counter-protester and two state troopers dead and dozens injured. Both have been frequently active in Chicago protests and other gatherings as a way to help heal the community and find closure. RJ, who asked their full name not be used, said a love of punk music sprang from earlier political leanings, but the genre became a safe haven to explore being queer among accepting people. "I wear lipstick to every show I go to. I'm a brown, queer, Arab-looking kid," RJ said. "So I"m really scared when I find out there are white supremacists coming to shows and beating people up. It makes me angry, because this is one of the few spaces I feel completely comfortable being as queer as I want to. I don't do that s--- on the street every day."